It is always comforting to be teaching PRI regardless of location, but last weekend I was in Detroit, MI. My wife's family are all from just west and south of the Detroit area, so I was in very familiar surroundings. And the host group of Team Rehabilitation was an excellent bunch to host Myokinematic Restoration. 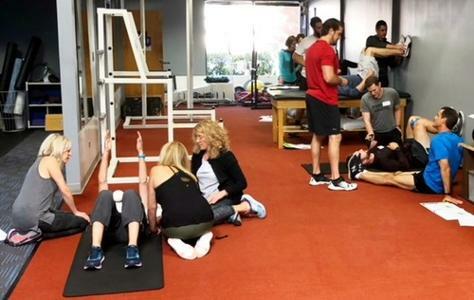 With a full room of nearly 40 health care professionals and movement specialists, and nearly all in attendance having never heard PRI previously, it was an awesome learning environment for everyone. This group was very dynamic and asked great questions. As this course evolves, we end up adding more and more lab time. This past weekend, 1/3 of the course was lab based, so we had ample opportunity to learn from each other. We started our dive into the difference between normal pelvifemoral mechanics around the normal neuromechanical presentation that is the L AIC pattern. Then we went deeper into normal compensation vs. pathological compensation patterns. We transitioned into muscular ramifications of the inability to get out of the L AIC pattern, which highlighted the importance of having a "good boy band" rather than a "bad boy band." We had ample time to practice the positional testing as we were able to determine what patterns we all had inside of us. Low and behold, every single one of the attendees proved to be in a PEC pattern. Based on this group of attendees all having the same extended pattern, we had to have the "Batman vs. Bruce Wayne" conversation. I was in a room of "Batmans”, and we all needed to be more like "Bruce Wayne." This necessitated a demonstration of how to get someone out of a PEC pattern and into a L AIC pattern, so the rest of the weekend had an opportunity to resonate with the attendees. With two activities, we were able to take a very strong PEC individual, and turn them into a L AIC pattern. Because underneath the bilateral extended patterns of the PEC lies a L AIC pattern. The "PEC busting" demonstration helped us proceed into the management of a L AIC pattern. Nearly the entire afternoon on Sunday was lab time, where everyone had the opportunity to find and feel hamstring, IC Adductor, gluteus medius, internal obliques, and gluteus maximus activity. Reports of "feeling different" and "feeling my hips" were common comments after our lab. My thanks to Team Rehabilitation for their hospitality. They know how to host a course! My thanks to Shelly DeRuiter and Craig Stasio, who were awesome lab assistants. Thank you to Cyril Shuster, Alexandre Vieria, Todd Cummings, and Michele Weis for your excellent questions and re-states. Thank you to Michelle Shrader and David Selak for allowing us to learn from you in our demonstration portions of the class. My hat is off to Alexandre Vieria, as he traveled from Brazil to hear PRI! I greatly appreciate our conversation around tennis players and the necessity to have excellent frontal plane integration. Thanks to everyone for great weekend! Thank you Ryan Murray and the rest of the Fortius Athletic Staff for hosting Pelvis Restoration this past weekend. Also, a huge thank you to Jon Rowe, CSCS, PRT, for being my lab assistant. This class was awesome with their questions, desire to learn and their attention the entire weekend. This course is challenging from the sheer amount of information given and you guys did great. Pelvis Restoration goes into great detail with position, muscle inhibition/facilitation and respiratory concepts behind "AFIR" and "AFER." I feel the concept of push/pull and asymmetry between the left and right side for alternation during the gait cycle hit home. Vancouver is a beautiful city and I hope to come back and visit. Thanks again!! Impingement and Instability (Everett Washington) - A beautiful weekend exploring PRI's secondary level course Impingement and Instability in the northern corridor of the Greater Seattle Area with the good folks at ATI in Everett. A big thank you to Alexa Degel, DPT for handling all the host site coordination issues and making sure I had all that I needed to pull off a great presentation. Your extra effort throughout the weekend made all the difference and was greatly appreciated. I would like to take the time to thank two attendees who traveled all the way from Singapore, Malaysia and one attendee who traveled all the way from Seoul, South Korea to be with us. David Lee, Wee Ho Lim and JangKeun Kye, you have my respect and appreciation for traveling so far to be with us. Two of the three attended as a direct result of an early trip Ron Hruska made to Seoul back in 2008. JangKeun, thanks for your pioneering spirit and for inviting your friend David to learn about PRI by traveling to America. And thank you Wee, for exploring the science of PRI and beginning your journey online (including through PRI home study courses), and now by attending actual live courses. I appreciate you being the demo for lateralized respiratory and airflow patterns and showing us how some of the techniques look when carried out with full respect for diaphragm dynamics. It was cool to see your amazement when your right HGIR and left Hor Shoulder Abd was restored to full and equal and full rotation was restored to your neck, after those same measures have not been fully restored at any time in the past. It was also fun to see how surprised you were when an old man (me), was able to drop into a full range of motion overhead squat right in front of you. You made me smile when you said, "I didn't see that coming". As a class, we learned how to go through a valuable check list of neurological reference centers ("brain"), lateralized performance criteria ("lane") and respiratory performance issues ("breathing"). The autonomic nervous system was very responsive to the brain, lane and breathing approach to balancing axial performance as we worked to minimize instability across the calcaneus, femurs, ilia and scapula. As I noted at the beginning of the course, this Institute is appreciative of each one of you and your journey to get through the introductory coursework and get to this point. I hope you found the journey well worth the effort and felt rewarded by your secondary level coursework experience. It seems that over the years the courses that I’ve taught for the Postural Restoration Institute kind of run together. So many times I’ve almost forgotten in which city I’ve been! I know that Ron and James have had the same experience. We’ve chatted about it before. This past weekend I was in St. Louis and I taught Postural Respiration at Complete Fitness Results and Nancy Hammond PT, PRC & Lesley Callaham PT, PRC were my wonderful hosts and were unforgettable. They took good care of me and made sure the class went well. Nancy owns Integrate 360 and she and Lesley really have a great operation! Their skills are obvious and they have a true patient following. When I think about Postural Respiration I wish that I could take 3 days and teach it. The concepts are challenging in this class for sure. I see a lot of folks again and again when I teach it. I don’t blame them either. It took me forever to wrap my mind around the details! Please don’t hesitate to reach out to us at PRI because we really are here to help you. We WANT you to succeed! Nobody gets it all in one weekend and the application of the science to your patients can be challenging for sure. So reach out! Email us! Call us! Send a smoke signal. Let us help and good luck! Another Strength Coach says “Super valuable course. Powerful material to help guide fitness professionals from driving dysfunction and pathology. The details and variations of exercises will help me better work with clients with dysfunction and pain patterns”. I am very grateful to the fabulous hosts: Mark Cibrario, Wynne Conklin, and Kyle Cibrario at The Trainers Club. Thank you for being so welcoming and gracious and we were lucky they hosted this course because the space was perfect and their passion for fitness and movement was spot on! We had a great mix of PRI trained attendees along with first timers and it made for a fun group. PRI experienced people appreciated how we simplified complex principles, avoided rabbit holes, and taught practical application, and new attendees got exposed to the big picture and application to start using key principles and to help facilitate better retention in subsequent courses. I’ve gotten to a point in teaching where the diverse audience we tend to attract is something that excites me and I love the challenge of uniting minds and professionals and helping all attendees look at axial movements and hyperactivity patterns for trunk stability through a different lens. Every course I learn something as we can all learn from one another! The brain reflexively searches and identifies patterns for motor learning, just as we learn components of larger movement patterns, its mastering some of these basic micromovement patterns that creates the stability and motor control many of our clients are searching for to move painfree. Motor control and instability issues are not always a problem of weakness or lack of strength. People waste time and energy trying to strengthen muscles that don’t need to be strengthened and then create misuse patterns further complicating the movement sequencing. This course is one of the only courses that breaks down three planes of movement of the axial frame into the micromovements that clients need to maximize output in larger movement patterns. This is a lab heavy course, as we break down components of foreign movements and get people practicing feeling them and coaching them right away. Organizing components of axial movement in the sagittal and frontal plane for proper loading and lateralization is so crucial for todays perception of postural health. On day 2 we discuss key neurorespiratory principles as related to larger movement patterns like the squat and deadlift, as well as single legged movements like the RDL, Bulgarian split squats and steps ups. If you have any interest in attending, don’t hesitate and sign up today for the Philadelphia course October 6-7. It will be our last course of this year and you don’t want to miss the distribution of this year’s course manual!! Its not too late to sign up! Sign up today to attend PRI Fitness and Movement at The Training Room Physical Therapy at Maplezone Sports Institute in Philadelphia, PA. See you there!! 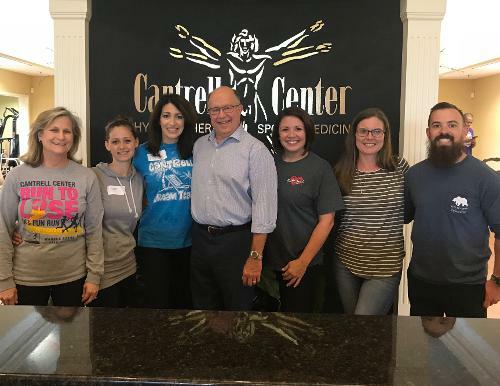 Regardless if you are a patient, a course attendee, a guest lecturer, or going there for consultation, when you enter the doors of The Cantrell Center for Physical Therapy, Sports Medicine and Wellness, you are family. The entire staff were engaging and enlightening. All of the course attendees accommodated my needs to embed the center of our orientation, the orientation for autonomics, and the conduit of zones, i.e. the foramen magnum and the vertebral foramen of the atlas, in organized tri-planar revolving movement. 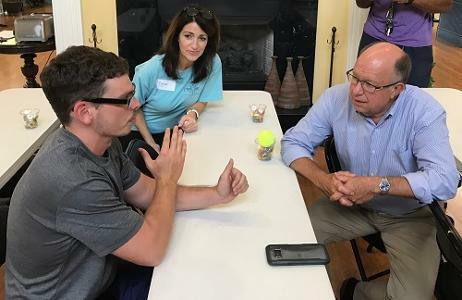 They helped me teach future attendees that will appreciate the needs to embrace laterality, asymmetry and sensory integration for cervical function. 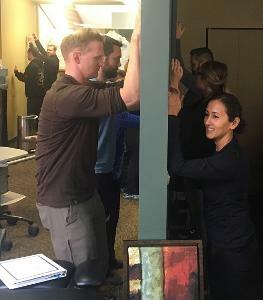 The content of this course reflected the attendees willingness to consider the reasoning for the neck to revolve, as well as the reasoning to restore appropriate universal tension provided or placed on the neck and its contents. There was a wonderful example of a left Side Bend positioned cranium in class that was so willing to allow me to demonstrate re-positioning and re-patterning techniques with it. Courtney Stearn DPT owns this cranium and she and her cranium, cervical spine and cortex were anatomical gifts to all of us. Her personality and behavior made the first day a complete day of enjoyment and learning. Thank you Courtney! Sitting to the right of Courtney was Amy Brown DPT who owned a cranium and neck that reflected right torsion through the sphenoid. She also contributed so much to the second day by allowing me to discuss her testing outcomes and her technique demonstration. She could not have been in a better place or in a better time for this presenter. Thank you Amy, we are all grateful for your attendance and willingness to share your head and neck. Course participation, by everyone, and I mean everyone, was awesome. So thank you for making this weekend a very special one for me. I can still see and hear Tassie Cantrell PT putting out strawberries and blueberries, putting furniture away afterwards, smiling ALL the time and answering questions on when she and her facility will be putting on another PRI course, and asking questions about O on A and A on O.
Lola Rosenbaum DPT thank you for being my “sphenoid” and Leah Whipple DPT thank you for being my “shift”. And finally, Skip George DC, PRC, thanks for being there, and mentoring me, and guiding me, and listening to me, and assisting me, and putting up with my metaphoric satire, and for loving me. We are excited to announce the very first "Travel with PRI" European Tour, following our Impingement & Instability course in Munich, Germany next September! 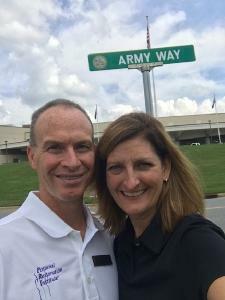 Don't miss the opportunity to not only travel with Ron Hruska, but also other PRI colleagues and friends to Germany, Czech Republic, and Austria. This 10 day tour will begin in Munich following the Impingement & Instability course (September 14-15, 2019). Travel from Munich to the Bohemian Czech village of Český Krumlov situated on the banks of the Vltava River. Next its on to Prague, the capital city of the Czech Republic. It avoided major destruction in WW II and is now much like a living museum. 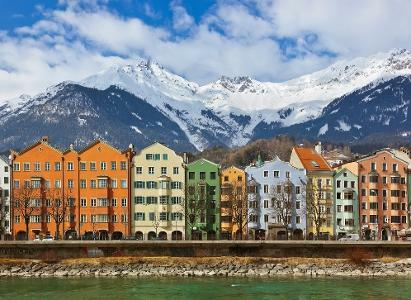 Journey to Olympic Innsbruck for a stay in the heart of the Tyrol. The city is surround by the majestic Alps. Conclude the tour in Munich as you sample the festive Octoberfest! This tour is limited to the first 50 registrants, and will require a minimum of 25 passengers registered by March 1, 2019 to be confirmed. To view the daily trip itinerary, along with pricing, CLICK HERE. Please contact tour coordinator Joan Hanson, MPT, PRC, CFC, DPT if you have any questions. We are very excited about this opportunity and would like to thank Joan for suggesting this fun idea. Now, who wants to travel with PRI on this amazing trip?! Providence, RI, one of the oldest cities in the U.S., is home to University Orthopedics. This PT clinic is GOAT, with large windows and water views on three sides, providing a parasympathetic balance to the focused attention on the impact of human asymmetry. It was wonderful to have professionals from different backgrounds (PT, PTA, ATC, CSCS, LMT) and skill sets come together to consider the profound impact of the diaphragm and rib cage on our movement. Following the discussion on the differences between optimal and sub-optimal breathing patterns, one attendee revealed that this was the first time in her life that she was able to inflate a balloon😊. The smaller-than-typical group size allowed for more one-on-one time in lab, ensuring attendees’ proficiency at carrying out objective tests and non-manual and manual techniques. Thank you to our models (Daniel Anthony, ATC; Kerri-Lynn Francis, LMT; Landa Pappas, PTA; Damion Perry, BS, CSCS; Joseph Robinson, ATC; and Maurice Sicard, ATC) and our reader, Stacey Brennan, MT, PTA – you greatly enhanced our understanding of course concepts. A huge thank you to our hosts at University Orthopedics (Dan Bien, PT, OCS, CSCS; Stacy Faiola, PT, CSCS; Kevin Mahoney, DPT, ATC; Dave Pezzullo, MS, PT, SCS, ATC; and Ed Wojciechowski, PT) for all of the work you put forth to provide a fantastic learning environment!